I've not disappeared! Just enjoying time as a mum and watching little "leaf" develop into a funny little, cheeky, lovable chappie! So I apologise for not keeping you all posted! 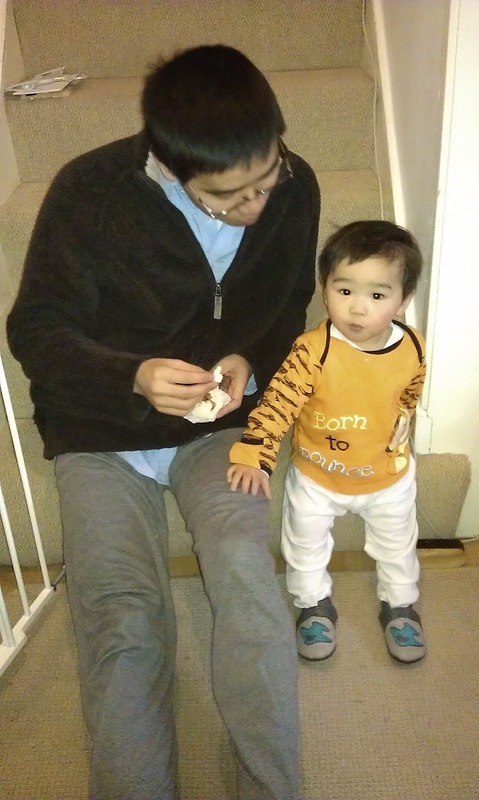 Minh's first birthday has come and gone and I will have to load up some photos of his grand day. We decided to get caterers for the food but I made all the desserts. This was a mighty affair! We had: Lemon Cheesecake; Blueberry Cheesecake; Fresh Fruit and Cream Gateaux; Tropical Fruit salad (ok, this one was bought in!) and Minh's crowning glory, a 3-tier birthday cake! Tiers were: lemon with homemade lemon curd, vanilla with homemade jam and to top, a gluten-free carrot cake with lemon butter icing! I also made iced biscuits for the children's party bags! Yes! It was hard work especially as cakes cannot be made too far in advance! Can you understand why we had caterers in now? Add water and vinegar together and knead until a fairly soft dough. Shape into a ball and let it rest, covered, for 30 minutes. Divide the dough into12 portions. Mould each into a smooth ball. Roll each out on a lightly floured surface to a circle about 4 inches across. Put a heaping teaspoon of filling in the centre and gather the edges inward, folding and pleating to make a neat join. 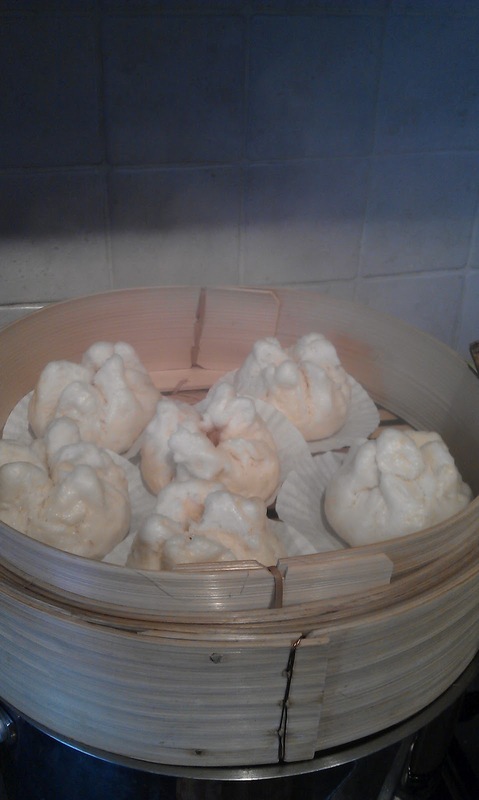 Put each bun, join upwards, on a flattened paper cake case, in a steamer. Cover and steam for 15 minutes. Fry shallot in a little oil, add finely sliced barbecue pork and fry gently for 2 minutes. Add water, char siu sauce and oyster sauce. Simmer for 3 minutes. Thicken with cornflour/water mix. Taste sauce for seasoning. Allow to cool slightly before using as bun filling. 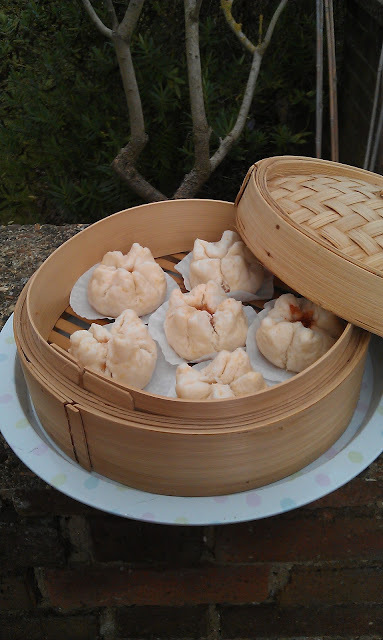 I will upload some piccies of the steamed buns later - the buns have disappeared so quickly I'm off to make another batch! I hope you are enjoying the festive period and are enjoying time with friends family and some great food! Happy birthday little leaf! And a job well done Mummy! That is an amazing amount of cake. Wow. Hoping you and your family are enjoying the festive season too. Did you make your buns? How did they turn out? The Chinese word for yeast is : 酵母. If it says it has that then you wouldn't need to add a raising agent. The Purple Orchid Brand of flour I use has a separate packet of yeast in the bag. I just don't use it.